Gray's New Map of Cincinnati. 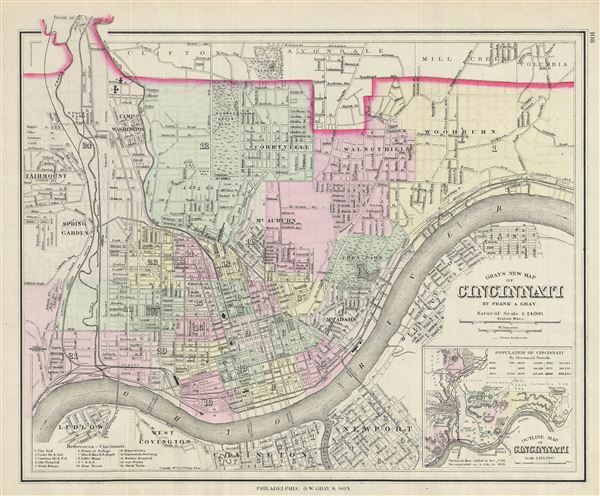 A fine 1877 map of Cincinnati, Ohio by O. W. Gray and Sons. It covers the city from Fairmount to Columbia south across the Ohio River to Covington in Kentucky. The map is extremely detailed, showing individual buildings, major and minor streets, railroads, cemeteries, parks, and several other landmarks. Various topographical features are also included. A reference key in included in the bottom left quadrant. An inset featuring the outline map of Cincinnati is included in the lower right quadrant. This map is copyrighted and issued by O.W. Gray and Sons, Philadelphia in 1877. Very good. Partial map on verso.